Begining as a duo, Greg Saunier and Rob Fisk started playing shows in the San Fransiso area. In 1996 Fisk and Saunier began looking for a singer and was introduced to Satomi Matsuzaki, a film student from Japan. They began playing as a trio shortly there after. Deerhoof has put together an extensive discography with a number of lineups, almost exclusively on the Kill Rock Stars label and now Polyvinyl. In 2004 the band reached the pinnacle of their careers when they released a split 7″ with Minneapolis band Sicbay on Modern Radio Record Label. 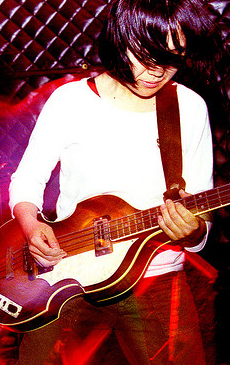 The songs for the split were recorded when Chris Cohen was playing guitar for Deerhoof.